Shortly after leaving at 800AM we heard over the radio that "Marcom" another 40 ft Bluewater ran aground in exactly the same place as "Looking Good" yesterday. There must be something strange about Bluewater Yachts. 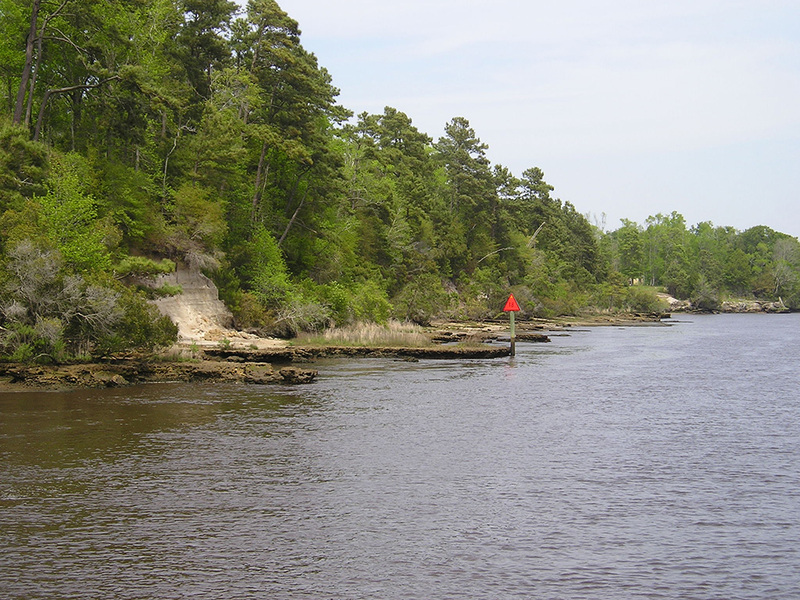 It was a day on the Waccamaw River which some say is the most scenic waterway on the east coast.. To us it just looked like the Cumberland with cypress trees along the banks. At Bucksport the rescue squad was diving for a boater whose fast boat had hit an object at high speed in a narrow winding river. We passed through the 'rock pile' without incident where the channel is narrow and rock ledges line the shore (see photo). At high tide the ledges are covered. Every mile or so there is a sign advertising the tow services and the propeller repair. We stopped at Crickett Cove Marina and had dinner at their restaurant.